Sealey was established in 1979 by John Sealey with a range of jacking and lifting equipment imported from Denmark. From the small beginnings the business now boasts over 5000 product lines and employs over 250 staff. Sealey’s warehouse boasts the biggest stocks in the business giving a wide choice with fast delivery. 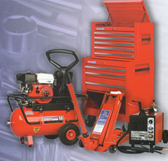 Sealey sell quality tools and equipment to the Garage, Workshop, Industrial and Automotive trades through their comprehensive network of independent dealers who offer service and support at a local level.